Introduction EMSL Analytical provides testing services, sampling supplies and test kits to identify asbestos hazards to protect workers and the public. Recently, Florida’s FOX30 reported about the discovery of asbestos-containing popcorn ceilings in a high-rise apartment complex for seniors in Jacksonville. The asbestos came to light after a fire back in December temporarily displaced well over 100 residents. When fire restoration efforts began, the popcorn ceilings in the complex were tested and according to the news story, asbestos was discovered. For several decades, popcorn ceilings were a standard method of texturing ceilings. Unfortunately, asbestos was used in some popcorn ceilings and these ceilings are not just an exposure concern following a fire, as occurred in Florida. For many homeowners with properties built between the 1960s and 1980s, one of the most popular home improvement projects is removing popcorn ceilings and many DIYers have no idea their ceilings may contain asbestos. 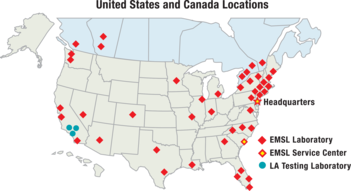 EMSL Analytical, Inc., with its network of coast-to-coast laboratories in the United States and Canada, provides comprehensive asbestos testing services and all sampling supplies needed to submit samples. They also offer easy-to-use test kits and a complete line of personal protective equipment (PPE). To learn more about asbestos or other occupational, environmental, air quality, health and safety testing services, please visit www.EMSL.com, call (800) 220-3675 or email info@EMSL.com. To access indoor environmental quality test kits, visit www.EMSLTestKits.com.